4: Fonthill in May, 2012: 100 years old and still going strong. Young Henry Chapman Mercer started his professional life by attending law school. Shortly after being admitted to the Pennsylvania bar, his natural curiosity and wanderlust got the better of him and he left law to travel the globe. While abroad, he nurtured his passion for history and archaeology, collecting books, artifacts and artwork he encountered in his travels. 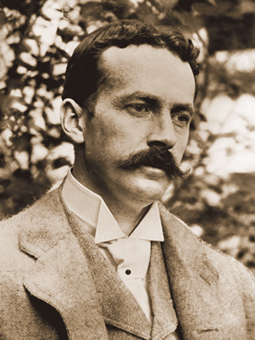 Upon his return to the States he accepted a manager position at the Museum of Science and Art at the University of Pennsylvania and spent several years on archeological excavations in the Americas. His interest soon turned toward the study and manufacture of ceramic tiles and he apprenticed himself to a Bucks County ceramist. Mercer soon mastered the craft and opened his own tileworks. In a time when the Industrial Revolution was transforming the way America built everything, Mercer remained dedicated to the ancient art of tilemaking. He became an influential figure in the American Arts and Crafts movement, and his handmade decorative tiles became highly sought after. He continued collecting, focusing now on early American artifacts, and amassed a personal collection exceeding twenty-five thousand objects. In addition to his tileworks, Henry Mercer also built a museum. But it would be his own home, a 44-room concrete marvel, that would become his greatest personal achievement. Henry Mercer began building Fonthill in 1908 and operated as chief architect and designer. 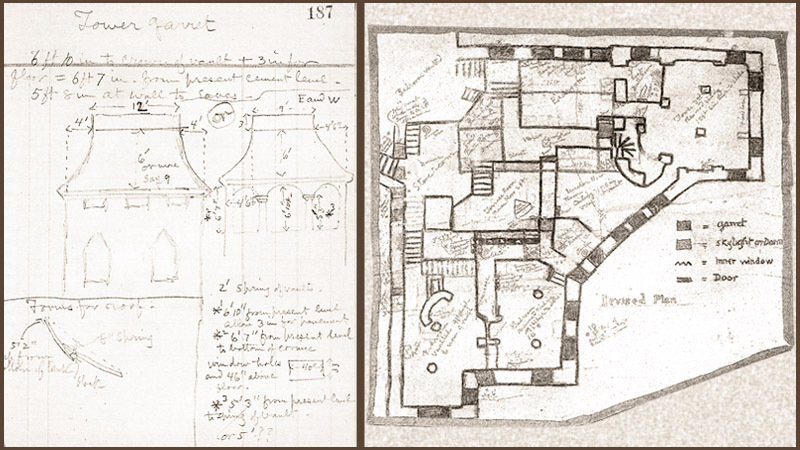 Every room was sketched by him, the interior spaces being worked out first and the exterior of the house made to fit around them. Not one blueprint was produced. A crew of eight to ten men (and one horse) completed the construction in three summers. It is made entirely out of concrete - every foot mixed by hand. Mercer largely dismissed accepted wisdom in concrete construction of the day, and chose instead to blaze his own path - often inventing new techniques onsite. 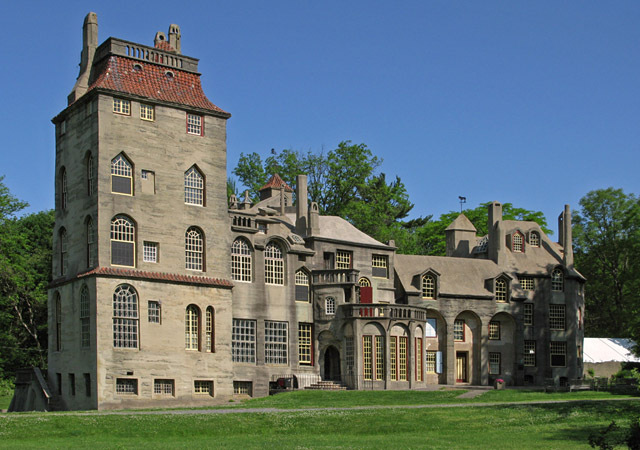 Fonthill's exterior is a commanding sight, but the interior is almost beyond description. 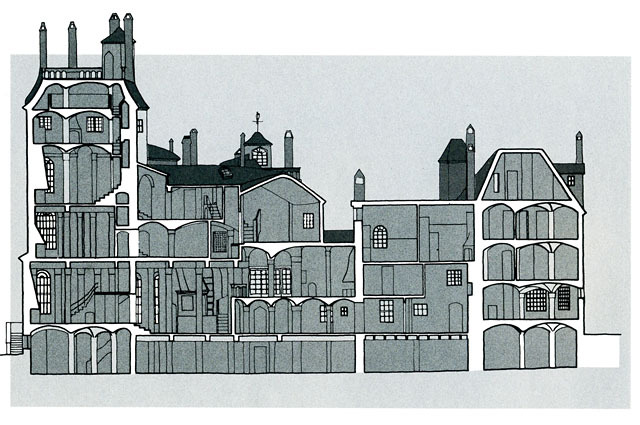 Believing grand staircases to be a waste of space, Mercer connected the 44 rooms of Fonthill with narrow, winding stairways, ornate hallways and an amazing variety of doors. It probably took me a half-dozen visits before I could competently navigate the interior. Each room is a unique work of art. Over 1,000 of Mercer's personal prints hang on the walls, more than 6,000 books line the shelves. Interesting artifacts hang here and there. Tiles adorn every room, often telling tales and recounting events from history. The tapestries and fabrics of the house show their age, but the tiles have retained their brilliance. Henry Mercer moved into Fonthill in May, 1912 - 100 years before I made my video and wrote this blog post. He lived there until his death in 1930. In his will, he left Fonthill to the public "as a museum for the exhibition and study of decorative tiles, decorative art, of engravings and woodcuts, and of the technical and artistic processes of concrete house construction." So what's a guy like me doing in a place like this? Over the years, I have occasionally pestered the staff of Fonthill to let me shoot a short film there. I contacted them over the winter to ask again and was finally granted access. Perhaps it's because Fonthill turns 100 this year, and I promised to deliver something unique in celebration of its Centennial. So I dusted off my time-lapse rigs and set about making something similar in technique to my Pennhurst piece. Shooting time-lapse video as opposed to straight video is akin to filling a bucket with a dripping faucet as opposed to a hose. Depending on your settings, ten seconds of footage requires roughly an hour of shooting. So even a three minute video requires a minimum investment of 15 hours. One obstacle is the weather. For example, if you're tracking light moving across the floor while clouds are moving past the sun, you wind up with what I call the "disco strobe effect". So I was looking for days either consistently clear or consistently cloudy. In addition to the weather, there is Fonthill's schedule to contend with. A stipulation of my being there was not to interfere with the tours - and they run tours seven days a week six hours a day leaving one hour at the beginning of each day, and one at the end to work with. As a result, my time lapse sequences were kept necessarily short, and some regular video was mixed in. But that's OK because my intention was to keep it short and sweet. All in all it was an extreme pleasure getting to know Fonthill and the staff there better. Fonthill Castle, like the man who built it, is truly one-of-a-kind. How is it possible that this even exists? It's beyond anything I've ever seen. Thank you so much for this blog I can't stop reading and watching and looking. ﻿ Wanna buy my videos?